Good afternoon, Blog Hoppin' friends! We are getting ready to dive into a week full of THANKS! 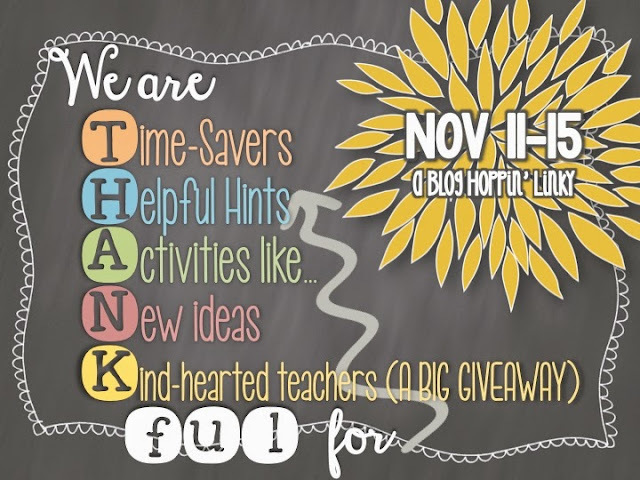 Blog Hoppin' will be hosting FOUR days of linky parties next week to share different things we are thankful for... all related to the classroom! So, if you are a blogger... we would LOVE for you to link up as much as possible! AND, if you are a follower, then get ready to spend lots of time in front of your computer because we have oodles of ideas to share! So, what will we be talking about each day?! Monday: We are thankful for TIME-SAVERS! Post ideas, tricks, classroom resources that help you save time in your classroom! Wednesday: ACTIVITIES LIKE... We will post about activities that we just love doing in our classrooms! Show us those WOW lessons! Thursday: NEW IDEAS! Have any tips that you've discovered recently that made you think, "Why haven't I been doing this all my life?" That's what we are posting about! And, you won't want to miss Friday! We are hosting a HUGE giveaway that will have MULTIPLE winners! So, stay tuned for that!!! We will see you back here on Monday for our first linky party!